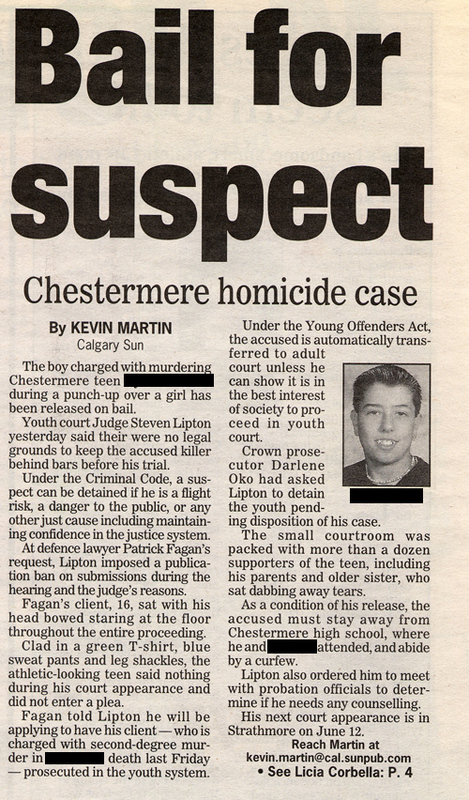 Bail for suspect: Chestermere homicide case - Patrick C. Fagan, Q.C. The boy charged with murdering Chestermere teen Tyler Trithart during a punch-up over a girl has been released on bail. Youth court Judge Steven Lipton yesterday said their were no legal grounds to keep the accused killer behind bars before his trial. Under the Criminal Code, a suspect can be detained if he is a flight risk, a danger to the public, or any other just cause including maintaining confidence in the justice system. At defence lawyer Patrick Fagan’s request, Lipton imposed a publication ban on submissions during the hearing and the judge’s reasons. Fagan’s client, 16, sat with his head bowed staring at the floor throughout the entire proceeding. Clad in a green T-shirt, blue sweat pants and leg shackles, the athletic-looking teen said nothing during his court appearance and did not enter a plea. Fagan told Lipton he will be applying to have his client-who is charged with second-degree murder in Trithart’s death last Friday – prosecuted in the youth system. Under the Young Offenders Act, the accused is automatically transferred to adult court unless he can show it is in the best interest of society to proceed in youth court. Crown prosecutor Darlene Oko had asked Lipton to detain the youth pending disposition of his case. The small courtroom was packed with more than a dozen supporters of the teen, including his parents and older sister, who sat dabbing away tears. As a condition of his release, the accused must stay away from Chestermere high school, where he and Trithart attended, and abide by a curfew. Lipton also ordered him to meet with probation officials to determine if he needs any counselling. His next court appearance is in Strathmore on June 12.